Nervous System: The nervous system of all animals is composed of highly specialised cells called neurons which can detect, receive and transmit different kinds of stimuli. The CNS includes the brain and the spinal cord and is the site of information processing and control. The PNS comprises of all the nerves of the body associated with the CNS (brain and spinal cord). The afferent nerve fibres transmit impulses from tissues/organs to the CNS and the efferent fibres transmit regulatory impulses from the CNS to the concerned peripheral tissues/organs. The PNS is divided into two divisions called somatic nervous system and autonomic nervous system. The somatic nervous system relays impulses from the CNS to skeletal muscles while the autonomic nervous system transmits impulses from the CNS to the involuntary organs and smooth muscles of the body. The autonomic nervous system is further classified into sympathetic nervous system and parasympathetic nervous system. A neuron is a microscopic structure composed of three major parts, namely, cell body, dendrites and axon. Cell Body: The cell body contains cytoplasm with typical cell organelles and certain granular bodies called Nissl’s granules. Dendrites: Short fibres which branch repeatedly and project out of the cell body also contain Nissl’s granules and are called dendrites. These fibres transmit impulses towards the cell body. 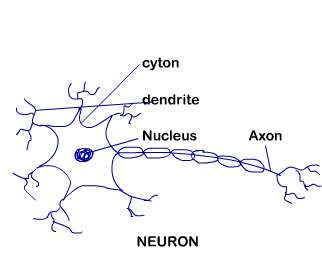 Axon: The axon is a long fibre, the distal end of which is branched. Each branch terminates as a bulb-like structure called synaptic knob which possess synaptic vesicles containing chemicals called neurotransmitters. The axons transmit nerve impulses away from the cell body to a synapse or to a neuro-muscular junction. Unipolar (cell body with one axon only; found usually in the embryonic stage). There are two types of axons, namely, myelinated and nonmyelinated. The myelinated nerve fibres are enveloped with Schwann cells, which form a myelin sheath around the axon. The gaps between two adjacent myelin sheaths are called nodes of Ranvier. Myelinated nerve fibres are found in spinal and cranial nerves. Unmyelinated nerve fibre is enclosed by a Schwann cell that does not form a myelin sheath around the axon, and is commonly found in autonomous and the somatic nervous systems.